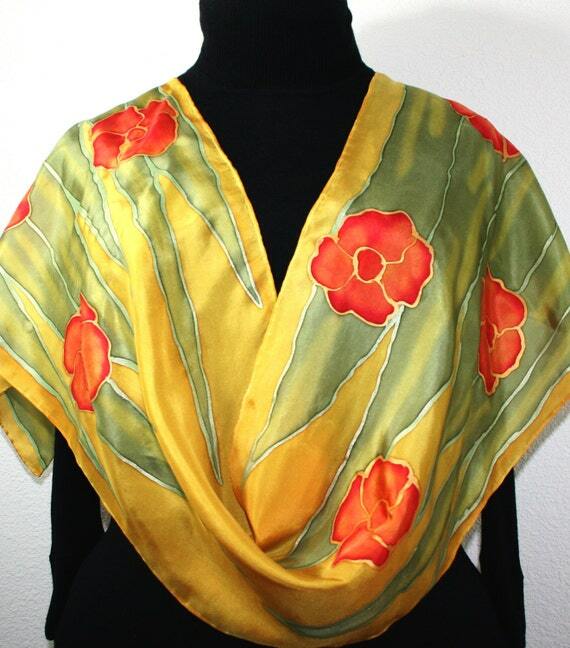 Silk Scarf Yellow Olive Red Hand Painted Shawl BLOOMING JOY, by Silk Scarves Colorado. Select Your SIZE! Birthday Gift, Christmas Gift, Anniversary Gift. Bridesmaid Gift, Valentine Gift, Graduation Gift. Gift-Wrapped. Elegant Handmade Silk Scarf. Hand Dyed Silk. Handmade in Colorado, USA. 100% silk. This is a 100% Habotai silk scarf featuring stylized flowers in red, with leaves in light olive, on a golden terracotta background. Outlines in metallic green and gold. Silk Scarf Turquoise Orange Hand Painted Scarf MOUNTAIN TRAIL, by Silk Scarves Colorado. Select Your SIZE! Birthday Gift, Christmas Gift, Anniversary Gift. Bridesmaid Gift, Valentine Gift, Graduation Gift. Gift-Wrapped. Elegant Handmade Silk Scarf. Hand Dyed Silk. Handmade in Colorado, USA. 100% silk. This is a 100% smooth China silk scarf featuring diagonal melting stripes in various shades of blue, turquoise, green, golden terracotta, orange, and red. Decorated with thin metallic accents in silver. NOTE: Please know that the shades of the colors (or the definition of the accents and/or brushstrokes) may slightly vary with each newly painted silk scarf. Each hand painted silk scarf is a unique piece of wearable art. THIS DESIGN CAN BE CREATED IN ANY COLOR(S) OF YOUR CHOICE! Just send me a message with your ideas, so we can discuss the new design. 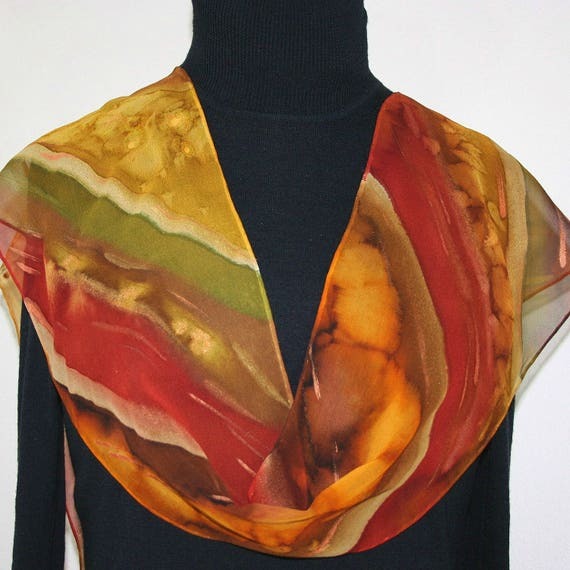 Silk Scarf Brown Orange Hand Painted Chiffon Shawl SMILING FOREST,, by Silk Scarves Colorado. Select Your SIZE! Birthday Gift, Christmas Gift, Anniversary Gift. Bridesmaid Gift, Valentine Gift, Graduation Gift. Gift-Wrapped. Elegant Handmade Silk Scarf. Hand Dyed Silk. Handmade in Colorado, USA. 100% silk. This is a 100% Chiffon silk scarf in hues of brown, burgundy, red, orange terracotta and moss green; decorated with metallic accents in gold and very light brass. 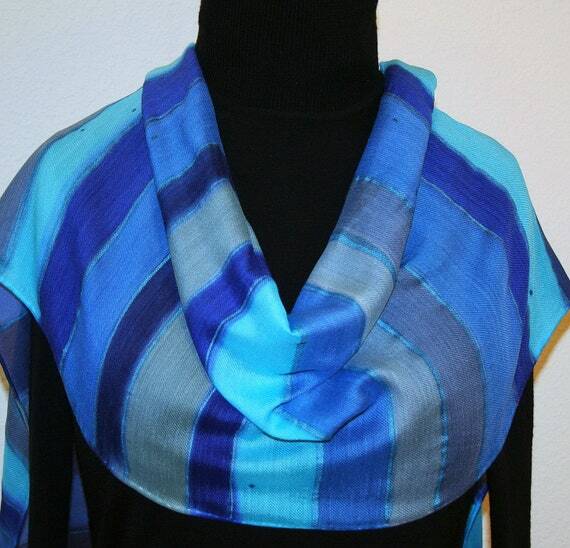 Silk Wool Scarf Blue Turquoise Gray Handmade Warm Shawl MOON PATH, by Silk Scarves Colorado. Select Your SIZE! Birthday Gift, Christmas Gift, Anniversary Gift, Bridesmaid Gift. Warm Soft Silk-Wool Wrap. Elegant Handmade Silk Scarf. Handmade in Colorado, USA. 63% silk/37% wool blend. MADE TO ORDER silk-wool scarf - the perfect gift! This wonderful scarf is a unique blend of silk and wool (63% silk/37% wool). It offers the warmth of the wool, combined with the softness of the silk, giving you the best of both worlds. This one is a lovely warm scarf in shades of blue - ranging from dark navy blue to turquoise, to sky blue, to darker gray, with some grayish beige; decorated with thin metallic accents in blue. 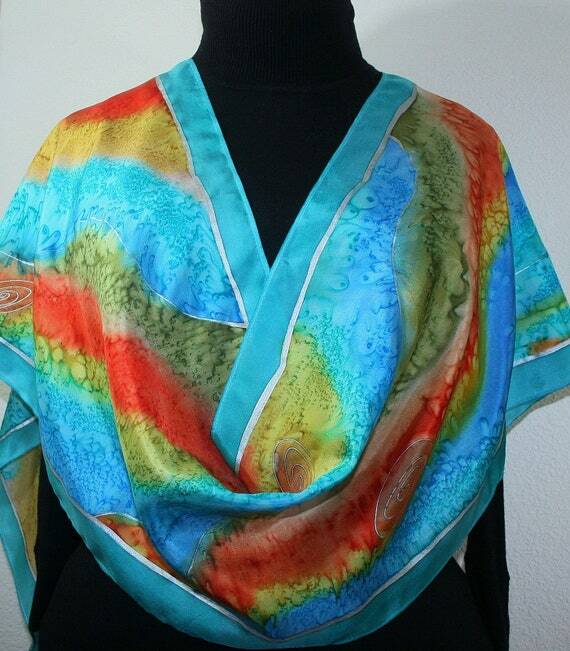 Silk Scarf Aqua Green Blue Hand Painted Shawl CARIBBEAN MORNING, by Silk Scarves Colorado. Select Your SIZE! Birthday Gift, Christmas Gift, Anniversary Gift. Bridesmaid Gift, Valentine Gift, Graduation Gift. Gift-Wrapped. Elegant Handmade Silk Scarf. Hand Dyed Silk. Handmade in Colorado, USA. 100% silk. 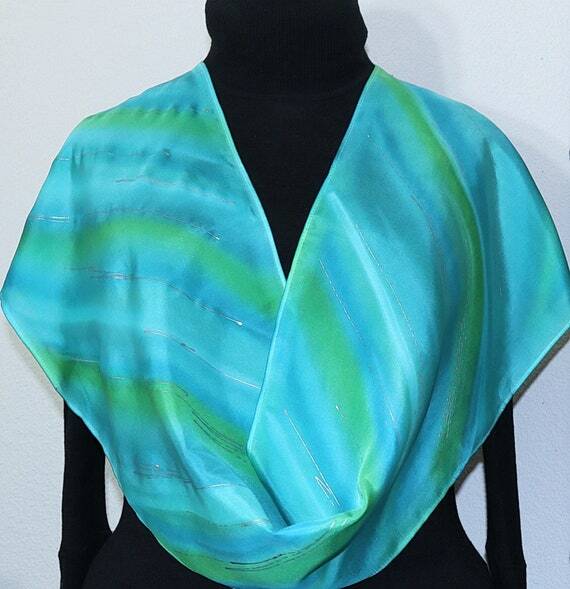 This is a 100% habotai silk (smooth China silk) scarf, featuring diagonal brushstrokes in aqua/teal, green and white; decorated with thin metallic accents in silver. It is a light and airy silk scarf, great for a walk on the beach. 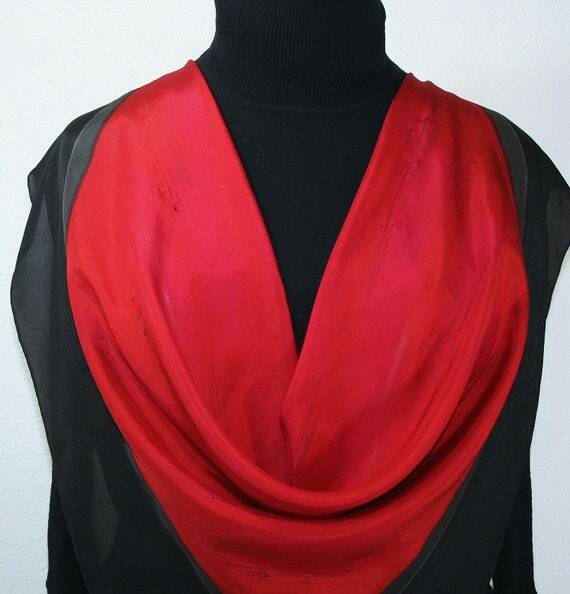 Silk Scarf Red Poppy Berry Red Black Handmade Silk Shawl NAUGHTY RED, by Silk Scarves Colorado. Select Your SIZE! Birthday Gift, Christmas Gift, Anniversary Gift. Bridesmaid Gift, Valentine Gift, Graduation Gift. Gift-Wrapped. Elegant Handmade Silk Scarf. Hand Dyed Silk. Handmade in Colorado, USA. 100% silk. This is a 100% smooth silk scarf featuring melted brushstrokes in several shades of reds - scarlet red, poppy red, berry red, magenta red. Decorated with thin metallic accents in russet and black. The border of the scarf is in black. It is a square silk scarf - very chic and elegant. NOTE: Please know that the shades of the colors (or the definition of the accents) may slightly vary with each newly painted silk scarf. Each hand painted silk scarf is a unique piece of wearable art. 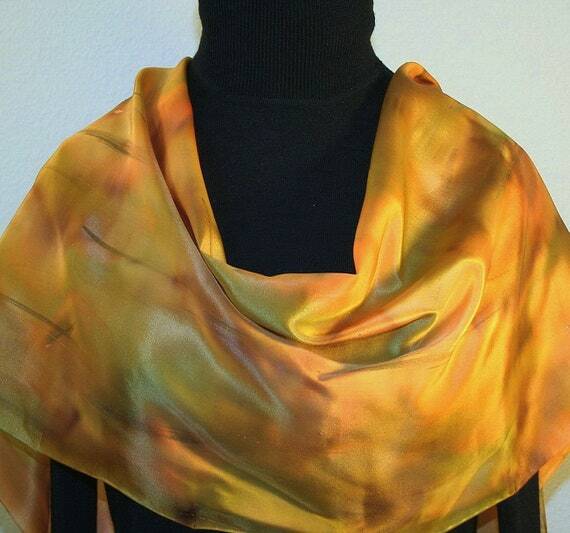 Silk Scarf Yellow Copper Beige Hand Painted Shawl AUTUMN MOOD, by Silk Scarves Colorado. Select Your SIZE! Birthday Gift, Christmas Gift, Anniversary Gift. Bridesmaid Gift, Valentine Gift, Graduation Gift. Gift-Wrapped. Elegant Handmade Silk Scarf. Hand Dyed Silk. Handmade in Colorado, USA. 100% silk. This is a 100% habotai silk (smooth China silk) scarf featuring melting segments in beige, golden terracotta, copper terracotta, light olive, and light brown; decorated with thin touches of gold. It is a chic and elegant silk scarf that makes a great accessory to any outfit. 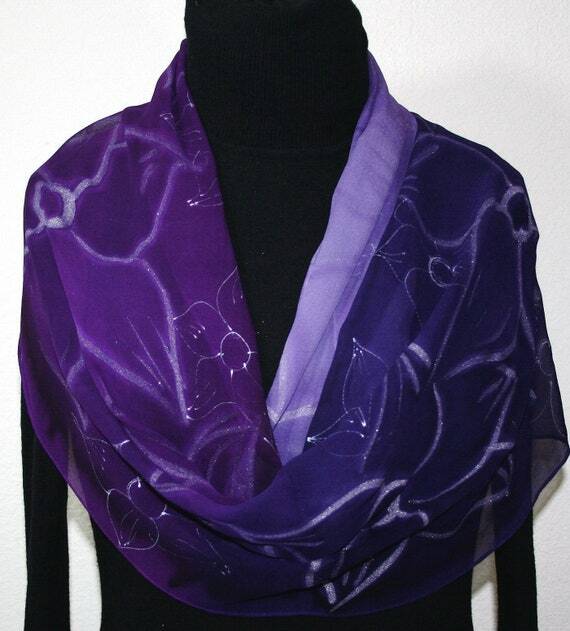 Silk Scarf Purple Hand Painted Chiffon Shawl DREAM FLOWERS, by Silk Scarves Colorado. Select Your SIZE! Birthday Gift, Christmas Gift, Anniversary Gift. Bridesmaid Gift, Valentine Gift, Graduation Gift. Gift-Wrapped. Elegant Handmade Silk Scarf. Hand Dyed Silk. Handmade in Colorado, USA. 100% silk. This is a 100% Chiffon silk scarf in three shades of purple from darker aubergine, through rich purple, to lighter lavender; decorated with larger and smaller size flowers in muted silver. It is a very elegant and feminine scarf that will make a chic accessory to any outfit. 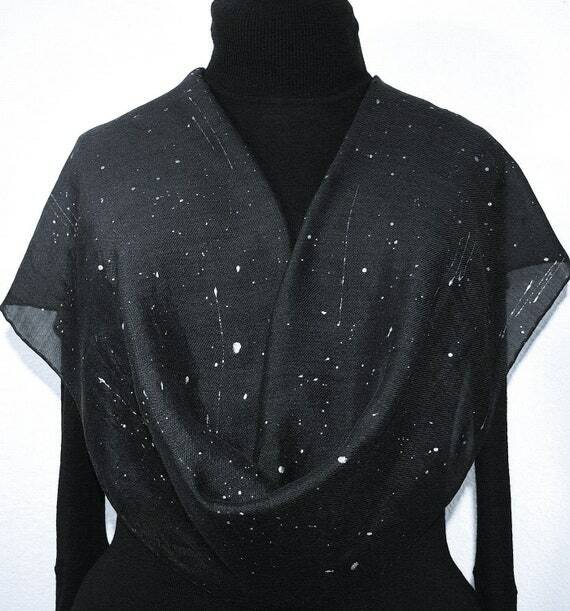 Silk Wool Scarf Hand Painted Black Silver Soft Warm Scarf NIGHT SKIES, by Silk Scarves Colorado. Select Your SIZE! Birthday Gift. Hand Dyed Scarf. Handmade Silk Scarf. Hand Dyed. Made in USA. 100% silk. This one is a lovely warm scarf in black, featuring small dots all over in silver, resembling sparkly raindrops. NOTE: The metallic drops/dots can also be done in gold, bronze, copper; or a mix of them all. Please select your preferred ones when placing an order. 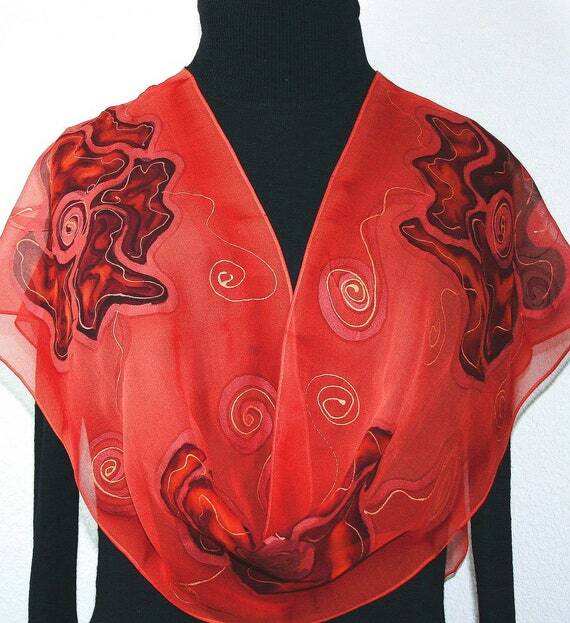 Silk Scarf Brick Red Terracotta Hand Painted Chiffon Shawl SUNSET LOVE, by Silk Scarves Colorado. Select Your SIZE! Birthday Gift, Christmas Gift, Anniversary Gift. Bridesmaid Gift, Valentine Gift, Graduation Gift. Gift-Wrapped. Elegant Handmade Silk Scarf. Hand Dyed Silk. Handmade in Colorado, USA. 100% silk. This is a 100% Chiffon silk scarf featuring stylized flowers in burgundy and terracotta, outlined in metallic russet, on a background in brick red. It is a chic and feminine chiffon silk scarf that would make a great accessory for any outfit. NOTE: Please know that the shades of the colors (or the definition of the brushstrokes) may slightly vary with each newly painted silk scarf. Each hand painted silk scarf is a unique piece of wearable art.